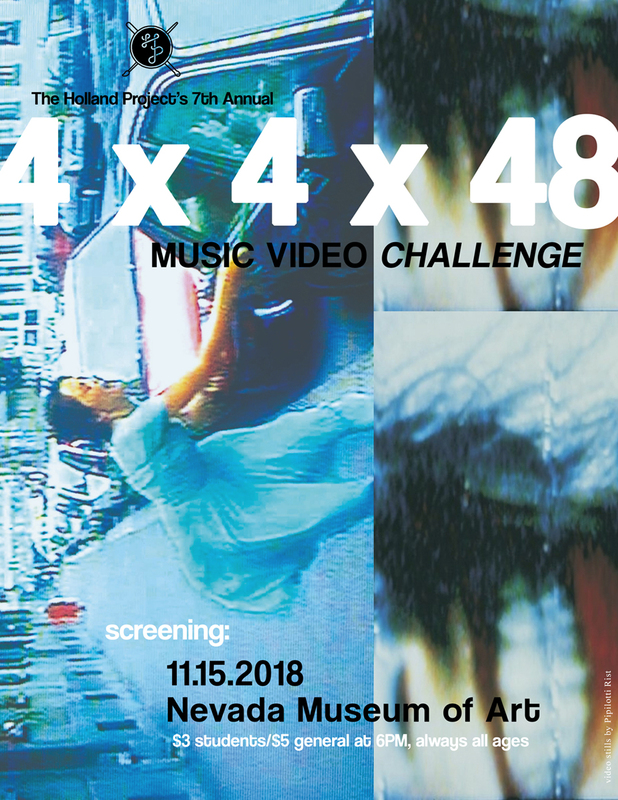 4x4x48 is a music video challenge event taking place in the fall. A bit of a misnomer, 4x4x48 initially started as 4 directors, 4 bands, 48 hours– we always sneak in a fifth director, and a fifth band, but the name has already stuck. For this project, Holland asks the directors to produce a music video project (for bands we select for them) in 48 hours, start to finish….from shooting, to editing, to completion. The films, once completed, screen at a special event at the Nevada Museum of Art with a Q&A with filmmakers and bands after the screening. The 2019 4x4x48 teams: Filmmaker and band teams will be announced in November! The filmmakers will have a full 48 hours to complete their film. In addition to the 48-hour time constraint, each filmmaker must incorporate 5 elements or requirements as determined by last year’s filmmakers into their films. Filmmakers can interpret each element as they wish, and be as creative as they choose, but each element must be represented. The elements will not be uncovered to the filmmakers until 8AM on the date of the challenge kickoff. 2017 participants: Todd Hayes directing for Josh Alexander, DeAngelo Bren Adams for Dancing Plague, People with Bodies for Team Francis, Alina Vergunova for Teen Creature, Hunter Moranville for Fine Motor, and Brianna Wollard for Surly. 2016 participants: Omar Pierce directing for Snack, Nick Minor for Blackstallion, Henry MacDiarmid for Lil Traffic, Elspeth Summers + James Coleman for Basha, and Robbie Racine + Johanna Richards for Rob Ford Explorer. 2014 participants: Tucker Rash directing for Casino Hearts, Jeannie MacDonald directing for Buds, Jon Shown directing for Marian Walker, Brandon Shirey directing for Plastic Caves, Anna Kernecker directing for Elspeth Summers. 2013 participants: Jesse McCloskey feat. Evynn Tyler; Sam Santoro feat. Televisions; Babs Laukat feat. Solterona; Denali Lowder and Dane Haman feat. Frontier City Sounds; and Alana Berglund and Kelci McIntosh feat. Alphabet Cult. 2012 participants: Megan Kay feat. Mark Van Norris; Charlie Hayes feat. Elephant Rifle; Dane Haman feat. Spitting Image; Tosha Palani feat. Dvchess; and Kyle Walker Akins feat. Mask K Raid.